A collection of technical tips, tricks and workflows I get asked about. Workflow is a new and extremely cool app on iOS that allows you to chain together apps and automate tasks. It's pretty hard to describe because what you can do with it is basically limited only by your imagination. Macstories has a very detailed review of it (as usual) that does a nice job covering it, and David Sparks has made a very nice video guide to walk you through it for a minimal charge. Here I'm going to focus on how I use it for capturing my daughter K's funny quotes as this is one of my most-used workflows. Previous to getting Workflow, I had a Launch Center Pro action set up that would allow me to quickly enter the quote, and it would then call Drafts 4, make a new note with the quote, add the date to the bottom of the quote, and append the quote & date to an Evernote note that I was keeping as the final repository. Recently, I realized that I don't really use Evernote for anything else and since these were just plain text notes, there was no reason for me to store them in Evernote's proprietary format, so I decided to move to a new system. The new system has a file in Dropbox and a note in Drafts as the final repositories of the quotes, and makes a small shift in the dates associated with the notes that I'll detail later. In one of the recent updates (perhaps when it went to version 4? I'm not sure), Drafts added the ability to recall the unique ID of any note. Because Drafts and Workflow play very nicely together, I can now recall the running quotes note and add the quotes to it, rather than having a new note for each quote. It's a bit long, but fairly easy to work through. First I take the quote as input (from the Launch Center Pro action, remember) and save it as a variable. (I then do some date math to figure out how old my daughter is (in years) at the time she gives us her amusing tidbit. I used to just display the date, which meant I had to mentally do the math to figure out how old she was - this way it will just add her at the bottom of the note and save me the effort in future.) After that, I ask myself if there is any explanation text that needs to be added. If I don't need any explanation, I can just leave the text input field blank and hit Ok. The workflow counts the characters in the input to see if I entered anything and assembles the final quote. From there it just recalls the specific note in Drafts and appends the quote, then appends it to the file in Dropbox as well. This way I've got all these funny quotes saved both in my phone (and synced to my iPad), and in Dropbox where I can get to them on my iMac and share with family. By setting this up on the main page of my LCP, I have fast access to it so I can make sure to document these as they happen. It is definitely a nerdy thing, but one that is helping me to make sure that I save these precious memories for future recall in multiple safe places. And now that it's setup, the ease of use is tremendous. Hopefully this writeup will have given you an idea on how to use Workflow to solve some of your own issues. 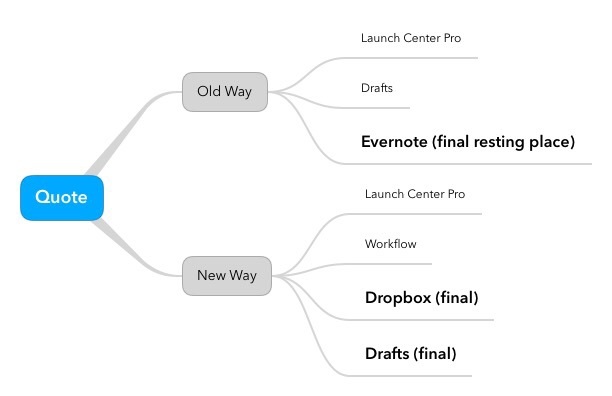 You can grab the workflow here and modify for your own purposes. I've recently been using Enlight to take pictures and edit them on the iPhone 5s. I became aware of it just a few days ago after seeing it highlighted in the App Store and decided to give it a shot. I've tried quite a few photography apps (I'm willing to bet more than $100 worth of them in the last year or so) over the years, and this one just seems to hit all the high notes for me - it has a clean interface that hides some fairly advanced editing tools, including and interesting swipe control for applying effects where you can dial in the effect to exactly the level you want by dragging your finger left (less) or right (more). These editing tools can be as simple as one tap, or if you desire can be fiddled with and customized to create your own looks. I really enjoy my custom presets in Lightroom on my iMac, so this feature fits how I think about editing photos. The kids (especially Joe) are rarely still enough for me to get good pics of them anyway without using the bigger, faster cameras so this interface being fairly simple (not the full on bells and whistles of some of the other more camera-focused apps (like Manual) isn't so much of an issue for me. Maybe when I upgrade to the 6 or 6+, I'll revisit those apps. If you are looking for something a little less-fiddly, I also like MagiCam for taking pictures fast and applying one of ~8 premade presets. It does a really nice job right after you take the picture - lots of those pictures (particularly outdoor ones) need no more editing other than a crop after the app applies the selected preset. When using the big cameras (like when on vacation when I don't have my iMac at hand every night), I really like ShutterSnitch for moving pictures to the iPad (you never have too many backups!). These are usually then edited in Pixelmator or Handy Photo on the iPad. Pixelmator is brilliant - I've really only scratched the surface of the iPad version, but the Mac version has replaced Photoshop for me. I just couldn't see signing up for the suscription service for the Creative Suite, and would honestly have thought had about upgrading Lightroom if it had been included in that. Handy Photo is also very cool and was one of the first apps I'm aware of to implement clone stamps for advanced editing on the iOS platform. Their Magic Crop feature is bonkers too. Both of those are highly recommended. I'll update this post as things change (and as I remember to do so), but this is a pretty good look at what I'm using these days. This is a constantly evolving process, but I've had a few folks ask me how I manage my pictures recently, particularly when traveling. This post will focus on my mobile photography workflow. Basic flow: Shoot pics, transfer to ipad, edit, share. My Canon 5DIII has both a Compact Flash and an SD memory card slot. When I first got it, I was disappointed by this, as I never liked the SD form factor 2. That changed when I first heard Jeff Carlson talking about iOS Photography on the Mac Power Users podcast 3. He mentioned the Eye-Fi card for moving pics to the iPad and I was sold. 4 Once I got the menu setting on the camera switched to acknowledge the EyeFi's network, I was able to see the wifi network that the EyeFi creates. From there, I open Shuttersnitch, select the appropriate collection (if this is the first time I've transferred pics on a given trip, I will create a new one) and the import process begins. Once the import has finished, I can easily mark my favorites and save them to my Camera Roll. I then use a combination of apps to edit the photo the way I want, including Snapseed, Camera+ and Handyphoto (amount others). That is the basic flow. A more specific use that I have for Dropbox is photo backups, for the photos on my iPhone. I think they give you 2GB of free space when you sign up, and will give you another 3GB if you download the app and allow it to automatically copy every photo in your camera roll to your Dropbox. Frankly, this is a no-brainer. Be like Nike: just do it. One final specific use I have for Dropbox is syncing settings. The most important of these is 1Password. This way, I can add a login on my ipad when I sign up for a new service and - once it syncs - I never have to worry about adding it on my computer or phone. Through the magic of Dropbox sync, it's just there. I'm not a programmer, but I am usually the nerdiest one in my office or circle of friends/family. I'm the guy who gets calls like: “How do I do this ?” 1 In an effort to capture some of these tips, tricks & workflows 2 for future reference, I am adding this separate page to the blog and will be trying to update it somewhat regularly as I get questions or come up with them. Much of this section will not be specifically related to photography, and most of it will be links to other (smarter/nerdier) people's work. I didn't invent any of this stuff, but I have spent some time researching these tools and if I can be the bridge between those clever folks and my friends/family who could benefit from their work by showing how I have applied it to my own life, I am happy to do so.